Where is the Midi In Thru button? Yesterday I tried all day to make any vsti to work in deckdance 2. But it appears that now only the vst (audio effects) are able to work, not the instruments. 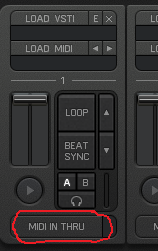 In deckadance 1.x, on the vst slots, there was a button called "Midi In Thru" which make it possible to play a vsti (a synth for example) with a midi controller without leaving deckadance. I tried with a hardware midi piano controller, and with virtual midi controller, and it's the same: Deckadance 1 receive the midi signal and play the instrument, but Deckadance 2 don't. (using same controllers, same vsti, same audio engine, etc). This feature was removed? There is something I am missing? I search the entire web before having to post here. It's not possible at this moment, but I will try to get this feature back asap (...passing MIDI messages from external controllers to hosted VSTi plugins). Yes, please, bring this back. It was the selling point for me!